One of my students wrote in her SOLC today that she is tired of Slice of Life. She doesn't know what else to write about. She doesn't want to quit; she wants to keep going, but she's tired. trying to balance my school work with being a wife, mother, and daughter...am I doing a good enough job? I'm tapped out tonight. I know this feeling won't last. I'll wake up tomorrow, refreshed and ready to face the week. But for tonight, I am with Dana. I'm tired. Tomorrow, we'll talk about what to do when faced with this challenge of not knowing what to write about. One of the things I love about SOL is that all of the writers in my room, including me, are on equal footing. I am not the expert here. I, too, get into ruts and need some encouragement. Any suggestions for what you do when you are in a rut that I can share with my 4th graders tomorrow? Any and all ideas are welcome!! Thanks to Ruth and Stacey for hosting the Slice of Life Challenge. I'm uplifted by the reassurance that I am not alone. I left a lengthy comment on Dana's post as well. I know how the comments left for me made me feel, so I hope to do the same for Dana. One idea I left on her post: Create a love it and loathe it list. Create a list of all the things you love! Then create a list of all the things you loathe (hate or dislike) – except there cannot be anybody’s name on that list! (No hurt feelings, right?) You will have plenty of slices of lists from those lists! Best of luck to you and your writers! Press on! A few days ago, Deb Day, at Coffee with Chloe, used what she called her Fallback Post. This might be one fourth graders could use. Also, write about one of your family's favorite food, or what you have in your lunch box today, or what you are planning to do after school. I'll go write on her blog too. This post is for Dana--I tried to leave a post on your classroom blog but it wouldn't let me. Hi Dana, I know how you feel. All writers get stuck from time to time. That's when you dig deep and think about all that you know and have done. That's when you take something ordinary and familiar and turn it on its side or upside down and find a new way to write about it. You find the twist in a straight story, stretch the truth a bit and add some action... and you keep going. You have lots of stories to tell and lots of people want to hear them or read them. I know! I am the same way, especially on a day I don't see Zaino! What a great lesson for kids though Julie! 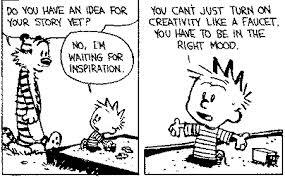 Even teachers struggle to come up with ideas! Tonight was the first night I really didn't have any idea what I would write about. I managed to work through it, but it was a little intimidating. I was happy that it didn't happen until day 19 as last year I think it happened on day 6. I know what Dana means about being tired. It's hard to get a decent piece of writing out EACH AND EVERY day. Especially with lesson plans, assessments to review, and newsletters to update. It never fails, when I write a quick post more people stop by than when I spend a lot of time on my writing. It's like going to the store without really getting ready --- you run into everyone. Like Dana, I want to keep going though. I'm getting a lot more writing done than I do when left to my own motivation. I've tried to collect "mentor posts" during the event. These are posts that the writing strikes me for one reason or another. Often, they are posts that give me an idea for my own writing (often the structure or topic). When I'm having a hard time I look at these. I also find lists and poetry a good way to get writing in a pinch. A list of possible ideas, a list of things I liked to do when at my grandparents' house, a list of things I love, etc., all can get me going. Often within the lists are many ideas for writing. Tell Dana, I know just what she means. We'll all look back at what we've accomplished and be proud of our work.